cash money records NEWS CASH MONEY RECORDS TO RELEASE THE BEFORE ANYTHANG SOUNDTRACK!!!! Cash Money Records has announced the release of the Before Anythang Official Soundtrack. 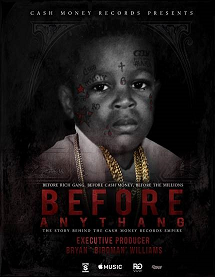 Before Anythang is the documentary detailing the life of Cash Money Records Co-Founder Birdman that was released on Apple Music this past February. The soundtrack is now available at all digital retailers. Before Anythang: The Cash Money Story documentary film debuted exclusively on Apple Music and iTunes earlier this year. XXL calls the film's portrayal of the rise of Cash Money Records "a fascinating story” and Hip-Hop Wired says “few can deny that Cash Money Records was one of the top independent music labels in Hip-Hop lore.” You can stream the film here and catch Birdman’s Beats 1 interview with Ebro Darden on the release of the soundtrack at the following link: applemusic.com/beforeanythang.